Seoul (Korea) - Nothing to do for Italy in the fourth day of play in the 18U Baseball World Championship in Seoul, the lineup of the Azzurri surrendered to the mound of Japan, with starter Yu Kambara in the head, who struck out eleven in seven innings of job on the mound, and got a 7-1 victory in the penultimate game of the first round. Japan went on the scoreboard in the second inning, with Takahashi who sent the ball bouncing off the field, advanced to third on the grounder by Kaneko and scored on the sacrifice fly by Sasagawa. Replication in the next inning, with the Japanese who built the only run thanks to Mori, pushed to second by the sacrifice of Iyota, to third by the single from Tamura and home on Otani’s gounder to shortstop Mercuri. While the European lineup drove in the darkest night against Kambara, who struck out six in the first four innings and when he didn’t do the job all alone, he got the best help form a perfect defense. The Asians scored twice in the fourth out of Cozzolino’s pitches and an error by the Italian defense. 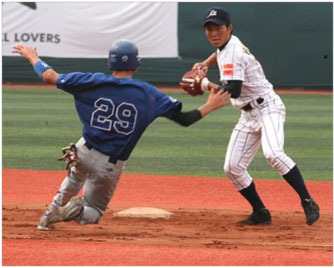 In the bottom of the fifth, Takahashi was walked and got to second on a sacrifice bunt by Kaneko, Sasagawa was also walked, a balk and a wild pitch made both score easily on Mizumoto’s double which also led to the replacement of Federico Cozzolino with Celli, who got two quick outs. Like the third, the sixth Italian offense is annihilated by three strikeouts of Kambara, who left the mound after seven innings, with three hits, one walk and 11 Ks. After the teammates scored for the seventh time, with a double by Sasagawa, and a sacrifice fly of Hojo, the reliever Takuna Sugawara allowed Italy score its lone run with a walk to pinch hitter Silvestri and two wild pitches and 7-1, also the final score of the game. The defeat allocates team Italy in the group of teams that play the positions between the seventh and the twelfth Wednesday, September 5 and the win keeps Japan's chances for the second round alive.